If you have location coordinates data, you can upload it as an Excel table (XLS) or CSV. This data can then be imported and added to a map as a layer. Make sure that a table doesn’t have a complex formatting (merged cells, double header, more sheets, font color etc.). Export your table as .csv and open table in common text editor (e.g. Notepad++). Latitude and longitude has to have WGS84 projection format (e.g. : 16.4986, -20.7458). Make sure that column separator is comma (,) and not semicolon (;) e.g. Flatlands Ave, Brooklyn, NY 11234, USA. First row (header) has to contain column title and all other columns have to contain data. For the header names use only English alphabet letters, digits and underscores (_). Use full-stop as a delimiter for decimal numbers. Go to Layer Tab or or open Database Manager. Select Import CSV or XLS function. Browse for the uploaded XLS or CSV in File Manager. 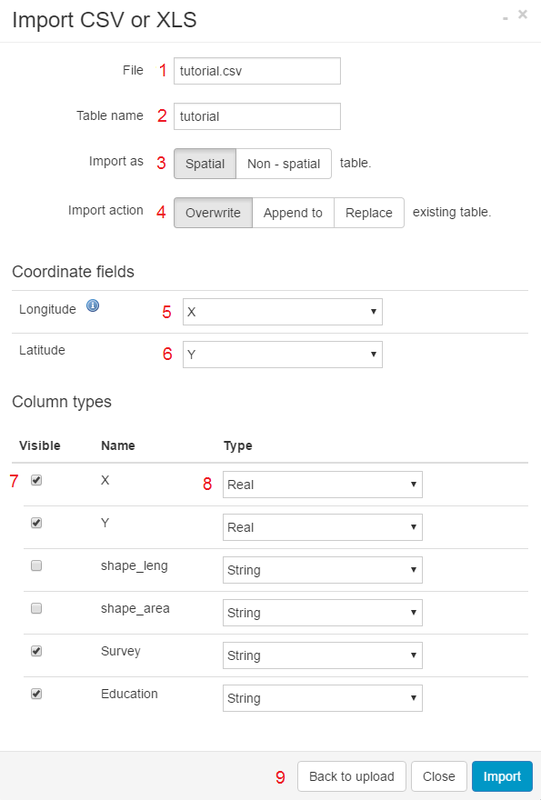 Set the table parameters, select the coordinate fields and click Import. 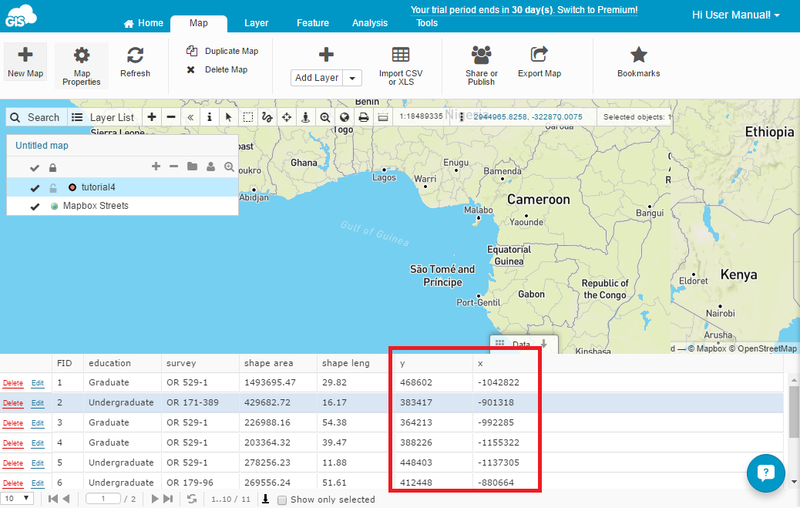 Import as – spatial table means that data will have coordinates, and the points will be displayed on the map. If table is imported as non-spatial table, only attribute data will be stored. Overwrite – if there is a table with the same name in the database, the new table will overwrite the old one. Append to – if there is a table with the same name in the database, a new table will contain both old and new attribute data. Replace – will replace the old table with the new one. Longitude – from the drop down list select a column that contains longitude data. Latitude – from the dropdown list sesect a colum that contains latitude data. Type – select column type in which original data is. String is used for text, Integer for whole numbers and Real for decimal numbers. Back to upload – navigates to the upload window. The imported tables are stored in Database and can be displayed on the map. Choose Database as a Datasource and browse your imported XLS or CSV. There are several possible causes for points located near Africa. In general, this means that system couldn’t recognize the geometry and located points at coordinates 0,0. Check the import parameters for X and Y. 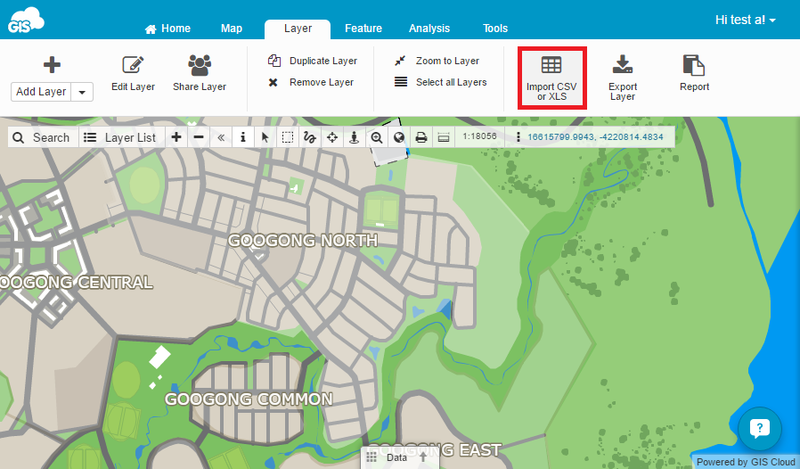 Select the correct fields for latitude and longitude and try to import the layer again. Check the coordinates format. 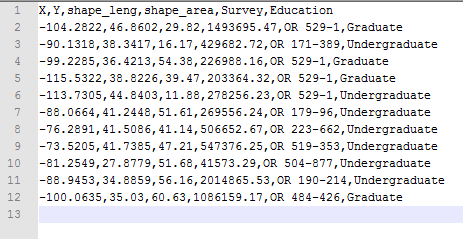 All coordinates have to be written in WGS84 projection format e.g. 13.2656,16.2657. If the coordinates in the table are in some other e.g. local projection, reproject them first in WGS84, upload the table to GIS Cloud and try again. This message indicates that the file is has invalid encoding. There are various encodings and they depend on the language and special characters. Open the table in some spreadsheet application and save it with default UTF-8 encoding. This indicates that uploaded file is XLSX or some other unsupported format. 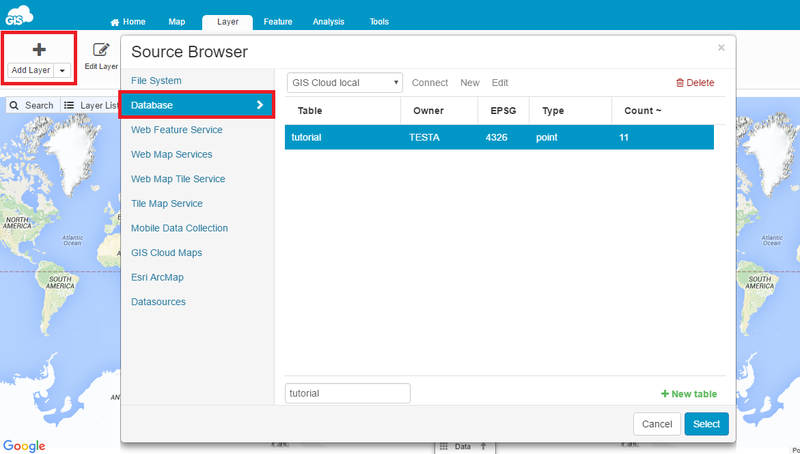 Save the file as CSV or XLS and upload it to GIS Cloud again. The import can also fail if there are unsupported characters in column names e.g. &%$#/() or spaces. Delete them from the column names and replace with the underscore (_). Upload the file and try again.